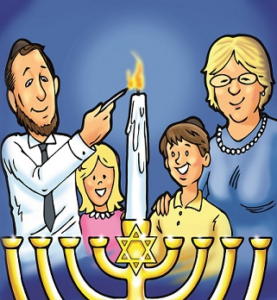 The following illustrations are from Maccabee’s Hanukkah Story showing you how to light the menorah. 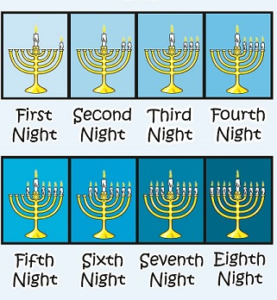 On Each Night Of Hanukkah You Start By Lighting The Shamash Candle, Which Is Always At A Different Height Than The Other Eight Candles On The Hanukkiyah (Menorah). 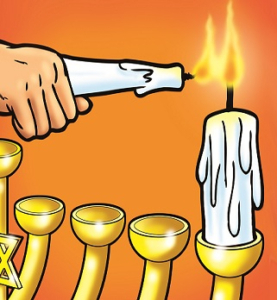 In Most Hanukkiyah (Menorah) The Shamash Candle Is In The Center of the Hanukkiyah (Menorah), But Not Always. 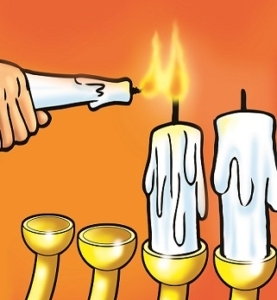 On The First Night Of Hanukkah You Light the Shamash Candle, Then Bring It Over To The Far Right Of The Hanukkiyah (Menorah) And Light The First Candle. Far Right Of The Hanukkiyah (Menorah). Again Light The Shamash Candle Then Coming Across the Hanukkiyah (Menorah) Light The Candle Closest To The Left And Then Light The Candle To The Right Of It That You Lit The Night Before. Enjoy The Family Experience, Happy Hanukkah!